The water to take to the Games - photo by Damian Devine. 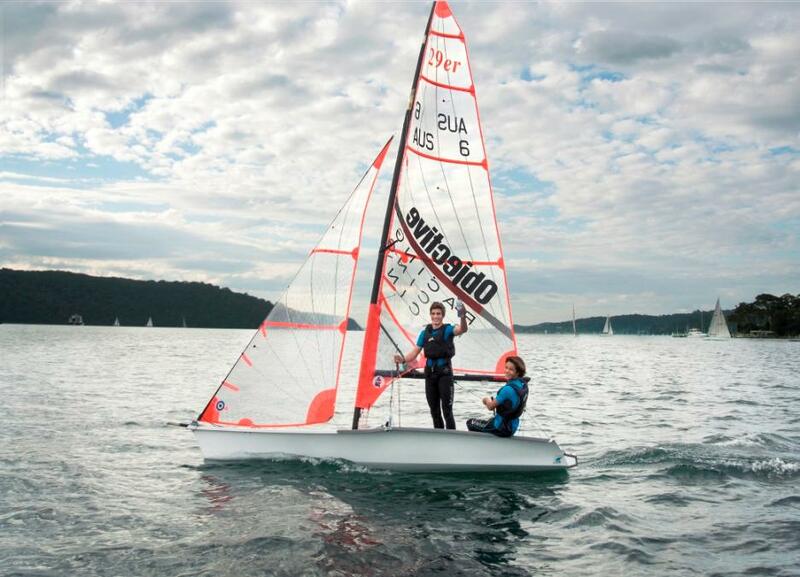 The Royal Prince Alfred Yacht Club youth sailors Jim Colley and Shaun Connor are heading off this week to prepare for the ISAF Youth Sailing World Championships in Portugal (12-19 July), representing Australia as part of the national youth sailing team in the open skiff 29er class. These 16 year old rising stars have been on a rigorous training schedule, on water & off water over the past 2 years and went up against some tough competition earlier this year to be selected in the national team and are the only team from NSW. Each country competing has been asked to take with them a 250ml bottle of water from their home waters to Portugal to be used in a symbolic international mixing of the waters ceremony, that embodies an Olympic type spirit. Jim and Shaun collected their peninsula bottle from their home water on Pittwater this week in readiness for the ceremony. Before the Youth Worlds, the boys will warm up at the 29er European Championships in Kiel, Germany, amongst a huge fleet of over 180 skiffs. After the Youth Worlds event in Portugal, the boys will pack their bags and head off to Kingston, Canada to step it up a notch to compete in the Open 29er World Championships at the end of July where they finished a very credible sixth place last year in their first year in this class. "We have worked hard for the past 2 years and our preparation has been great. Feeling confident and just really excited to go," added Connor. Both Jim & Shaun greatly appreciate the ongoing support from Objective, Yachting Australia & the RPAYC, who have helped make their campaign possible. To fund their sailing trips and equipment they have both raised money through raffles, hard work and a sponsored sail with 10% of the money raised going to sailors with disabilities. Colley and Connor prepare for the Worlds campaign in the 29er. The Royal Prince Alfred Yacht Club's Youth Development (YD) Program was pioneered in Australia in 1995 by the Royal Prince Alfred Yacht Club. The club’s commitment to youth training has resulted in the creation of some of the finest sailors racing today. We have produced sailors who have won National and International events. The RPAYC Youth Development Program includes not only improving existing sailing skills in Fleet and Match Racing, but also includes boat maintenance, gym fitness sessions, lectures and seminars and inclusion in all club activities ranging from Race Management, volunteer coaching and crewing on members keelboats and centreboard racing. The program runs over the winter months from May through to spring in October.